KKTBM‘s rap/hip-hop act Sean Dennis a.k.a SD is back with this killer tune titled “NSIDO”, meaning “What Is It?” in Ibibio. After gaining new grounds and building up more fans from his previous single /video “Almost Famous”; this Akwa Ibom born rapper silenced his critics here as he brings out the energy on the beat produced by Meli. SD is not slowing down, he is set to drop his highly anticipated mixtape next year which features label mates Yung6ix, Percy and rappers like AQ, Ycee among others. 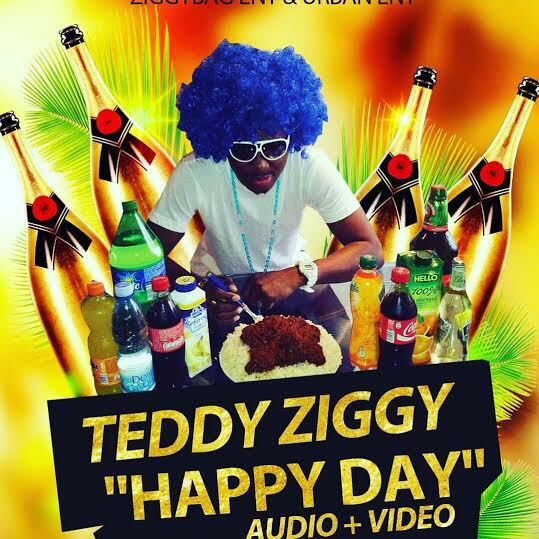 ZiggyBag Entertainment and Urban Entertainment music star Teddy Ziggy unlocks the video of his new single titled “Happy Day”. The Prodigal Son crooner who just Released his Mixtape 14 Tracks Album “PRODIGAL SON” Last week, decided to top the Album up with this new beautiful Video for his fans to Rock this Festive period. Kourtney Kardashian was on mummy duties on Thursday as she took her 11-month-old son Reign to a play date in Beverly Hills on Thursday. The yummy mummy looked as stylish as ever in a clinging black dress which she wore under a leather jacket and teamed with flat lace-up boots for the outing. But it was adorable baby Reign who really stole the show in a pair of jeans and a printed Yeezus jumper. The little tot looked like he was made for the spotlight as he pulled faces at the camera. There was no sign of Reign's brother or sister as the 36-year-old made her way into a friend's house with him cradled under one arm. Kourtney and Reign's outing comes after it was reported the reality star is giving her relationship with Scott another go. Scott, who left rehab last month after a four week treatment program, moved out of the home he shared with Kourtney and their three children in July after he was dumped by his girlfriend of nine years. But after working hard on his recovery, he's managed to get yet another chance, according to an insider. "Scott has been integrating back into the family and things are going really well. They're a family unit again," a source told E!News, "When Kourtney talks about them, she says 'We.' It's no longer just her and the kids. It's all of them." Scott has been spotted hanging out with Kourtney over the last few days and even spent Thanksgiving with the family. While the couple are less sure about their own romance, the insider claims it won't be long before they are officially an item. "They've always loved each other," the insider went on. "And she let him back into the family." Is everyone turning on the successful star? Just after it was claimed her ego is destroying her close bond with her family, Kylie Jenner is reportedly in danger of losing her close friends too. The selfie enthusiast, who turned 18 just months ago, has allegedly turned into a “self-obsessed bore” and pals can’t stand to be around her. Radar claims sister Kendall and her famous friends no longer want to hang out with her and that’s why she’s turned to Tyga’s pals. “She spends most her time with Tyga‘s crew now, even when he’s not around,” an insider told Radar. But if her friends are turning against her, the brunette bombshell doesn’t appear to be fazed. “She couldn't care less about anyone else but herself,” the source added. Kylie recently admitted she didn’t have a very close circle of mates, saying she only has two close friends. The TV star it's because she's paranoid about people using her for her fame, telling Interview magazine: "I always felt like people weren't friends with me for the right reasons, and they would be like, 'You know everyone is just friends with you because you're famous,' or just weird stuff. Triple MG buzzing artist- Tekno serves up the visuals to his new heat “Wash’ that was received with rave reviews. ​​Known by his artistic name Damz, Athena Records frontline act “Damilare Odueso” who released his debut single Awelewa sometime last year (2014) is taking no chill as he enlists YBNL General ‘Olamide’ alongside the Ibadi and Soke crooner “Niniola” for the remix of his previously released DavStyle produced single entitled ”Carry Am Go”. Unlike the regular, Damz decides to bring a different feel to the Remix of Carry Am Go by joining forces with Nigerian prolific “wicked” music producer Young John and they both came out with an extraordinarily good sound.